Think of it as the appetizer. A scrumptious two-serving app at that. The days of Purple Celebration unofficially kicked off Wednesday night at the Dakota Jazz Club in downtown Minneapolis with separate performances by Prince associates – LP Music and Shelby J.
LP Music, which played the early show, is a jazzy combo featuring ex-Prince tenor saxophonist Eric Leeds (hence L) and bassist Paul Peterson (hence P), who played in the Time and the Family. However, as Leeds said, they have an open marriage and Peterson was gigging in Australia as St. Paul and the Minneapolis All-Stars with guitarist Mike Scott, keyboardist Ricky Peterson and others. Leeds turned to bassist Tony Axtell, longtime sound man for Garrison Keillor’s “A Prairie Home Companion.” And Axtell fit right in with a simpatico group of players that found the groove as Leeds and keyboardists Peter Schimke and Brian Z were featured as lead musicians. As a soloist, Leeds came across like a storyteller, spinning yarns with his expressive passages filled with twists and turns in the plot. The uptempo pieces like the funky “The Perfect 10” and the sometimes frantic, multi-ethnic-flavored “Pacemaker” were crowd favorites in the winning 100-minute set. The audience left and a new crowd, filled with purple-clad and Prince glyph-wearing fans from all over the world, found their seats for the Shelby J show. For 10 years, she was a singer in Prince’s NPG. Prince told her never to refer to herself as a backup singer but as a vocalist. The 44-year-old North Carolinian certainly proved her bona fides as a vocalist in her 85-minute set. Shelby is an exuberant personality who kept a positive message in her patter and her songs. She even gave a shout-out to Prince as if he were sitting at his regular table in the Dakota balcony. (Actually, Prince’s brother Omarr Baker was there.) As for the music, she performed material from debut solo album, “10,” which is being released this week. It took Shelby a minute to hit her stride but once she got carried away, she was unstoppable. “Superpower” suggested “Lady Marmalade” turned into a southern soul tune as it built to a foot-stomping frenzy. “Run” was a sweet acoustic love song that had the suddenly silent Dakota audience attuned to the subtle nuances. But then Shelby revved it up. 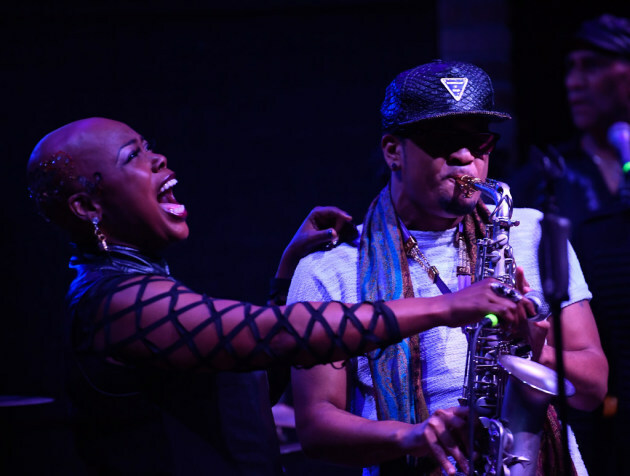 Special guest Adrian Crutchfield (below), a saxophonist with the NPG Horns, played an instrumental taste of Prince’s “A Love Bizarre” as an intro to Shelby’s reading of Allen Toussaint’s “Yes We Can Can,” which had the crowd feeling the funk in the intimacy of the Dakota. The surprise tune was “Why Come” by Shelby’s old band, Black Gypsy, members of which accompanied her at the Dakota. The funk-rock workout had the entire crowd dancing. 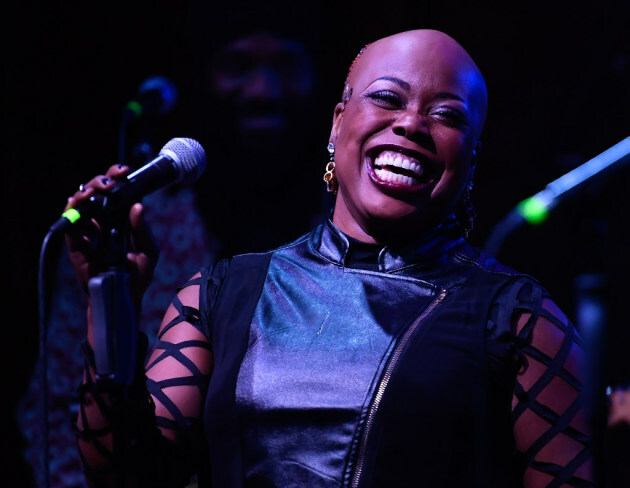 She encored with Prince’s funk history lesson, “Musicology,” during which she was joined by fellow NPG vocalist Liv Warfield for a quick dance. Shelby J will perform again at 10 p.m. Thursday at the Dakota. Meanwhile, the Celebration at Paisley Park runs Thursday through Sunday.